The song – “Welcome to Lithuania” was written by Jurgis Did and his former band “InCulto” in 2003. Back then, the market was flooded with TV ads contracted by various tourism departments of the world. All the exotic destinations were calling to visit their luscious mountains, exotic forests and other wonders of the world. InCulto began to wonder what would Lithuania have to show in an infomercial? Since Lithuania is not known for traditional tourists attractions that scream exotic wonderland – they wanted to create a parody of sorts, showing what Lithuanians are proud of. That’s how “Welcome to Lithuania” came about. By creating the list of all the fun Lithuanian assets they soon realized the biggest treasure was actually the Lithuanian people. The catchy tune soon became a hit – with Lithuanians around the world embracing the song as a silly anthem, that had hidden meaning about the true Lithuanian pride – the land of beautiful people. As with all the songs, an inside joke in Lithuania became a part of cultural heritage. It often comes back to life when people want to greet someone to Lithuania in a warm and friendly manner. Fast forward to 2018 – the song once again was resurrected as a hit that symbolizes Lithuanian hospitality. It all began with the news that the Ball brothers, stars of a reality TV Show ‘Ball in the Family’ had signed to play professional basketball in a small Lithuanian town of Prienai. What followed was a lot of media coverage questioning the unconventional decision. It even got one of the sports commentators so excited, that he sang ‘Welcome to Lithuania’ during a live coverage of a basketball game, which went viral. The US media coverage of Lithuania was quite dim, considering the Ball brothers were headed to play basketball in a small provincial town. Some Lithuanians were also apprehensive about what the arrival of the ‘basketball Kardashians’ would mean to the image of Lithuania. The international media embraced the song with open hearts. 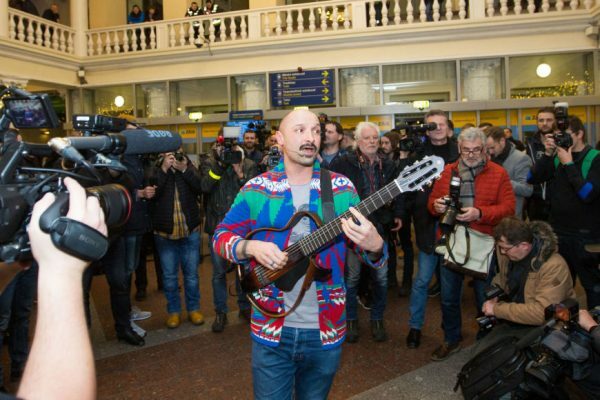 “…how about that “Welcome to Lithuania” song? What a jam! There’s nothing more exhausting than stepping off an airplane and having to lug your body and belongings through an airport as you seek out your destination, but I would imagine it’s a little less taxing when you’re in a luxurious airport soaking in the majestic sounds of a smash Lithuanian record. ” – says Pete Blackburn from CBS Sports.